Marvelous villa with breathtaking ocean views!!! Open outdoor living with and inviting pool. This is what Caribbean living is all about. 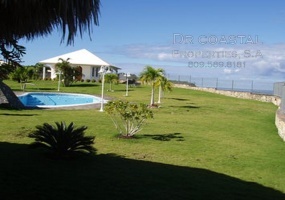 Manicured yard with many tropical plants.This villa is located at the edge of a high cliff overlooking the blue Atlantic Ocean. Fully furnished villa with exotic tropical gardens!This well built villa Is located on the green lush hills of Rio San Juan surrounded by nature but only 3 minutes away from town and many tropical beaches. 3 houses for the price of 1!! !Move to the Caribbean and live in a true bohemian place! Very peaceful, water pond with fishes and waterfalls, water, electricity, brick oven, and lots of trees and birds. There are 3 houses on this property: 1st house: 3 bedr, 2 bathr & an attic. 2nd house: 2 bedr, 1 bathr. 3rd house: 1 bedr, 1 bathr. Luxurious Villa with Impressive Ocean View! !Delightful Panoramic Ocean View as you walk in thru the front entrance!There are 3 floors of spacious living in this 5,400 SF/500 M² Villa, with 5 bedrooms and 5.5 bathrooms.Main Level has a modern, fully equipped kitchen with marble counter tops. Kitchen bar with swivel bar stools. 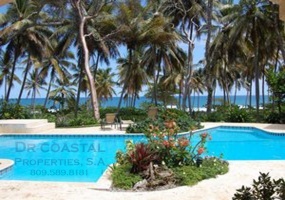 Luxury Ocean view Villa in the most exclusive gated community! !This magnificent villa is located in the most luxurious gated community in the Cabrera area. The villa has a very unique stretched out design which has ocean view from every room. The entrance is a semicircular car driveway. It has covered garage. BEAUTIFUL NEW AMERICAN HOME + APARTMENT! OCEANFRONT 5 BR. 5 BA! BEAUTIFUL 3 BR. 4 BA. NEW AMERICAN BUILT HOME + SEPARATE & PRIVATE 2 BR. 1 BA. APARTMENT!! Come watch the whales from your living room, your bedroom, or the roof top!Huge/Stunning house and attached guest apartment right in front of the ocean; perfect location. Protected space from front of house to ocean. Just west of new Playa Grande multi-million dollar development. 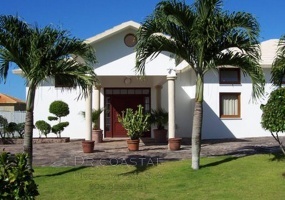 House in excellent conditions in the most peaceful street of Cabrera! This house is very well built. It has a spacious living room and kitchen. There is also a laundry room and storage room, 2 water tanks one of 1,000 gallons and the other one 275 gallons, nice yard with lots of fruit trees, covered garage and the best of all is the tranquility of this street. Country villa with spectacular swimming pool and gigantic gazebo `This villa located only 5 minutes from Cabrera is in excellent condition. It just has been renovated. Everything works! It has spacious rooms and good lighting.The villa is divided in two, the bottom with 3 bedrooms and 2 bathrooms and the top with 2 bedrooms and 2 bathrooms.The yard is one of the best in the whole area. Villa in the most exclusive Gated Community!!! Villa Florita is located in an exclusive beachfront community, one of the most highly regarded on the North Coast.This 3 bedroom, 3.5 bathroom villa is on a beautifully landscaped lot, with mature plants.An oversized covered patio overlooks the incredible pool and azure Atlantic Ocean.A winding staircase leads to the gorgeous beach below.